The Jimmy Butler era in Philadelphia was never going to be seamless. There were always going to be adjustments for everyone, from each of the stars, to Brett Brown and his league-low pick-and-roll usage. Maximizing three stars like this takes time. When thinking about specifics that can change moving forward, there’s one offensive adjustment for Ben Simmons that springs to mind. And as well as he’s been playing with Butler so far, it’s something we’ve rarely seen — Simmons operating as a roll man. The idea of this has always been enticing. Simmons, despite not having a reliable left hand or a wide array of scoring tricks and footwork around the basket, has plenty of tools to utilize as a roller. He’s 6-foot-10, highly athletic, and has incredible play-making ability to make the sort of passes out of short rolls that hardly anyone his size can. We just haven’t seen it experimented with much in games. After all, Brett Brown used the pick-and-roll less than every other team in the NBA last season. He hasn’t had the best personnel for it either. The Sixers have lacked a ball handler who can facilitate and provide shooting off the bounce to punish defenders going under the screen. That’s no longer the case with Jimmy Butler now around. Unsurprisingly, his pick-and-roll frequency hasn’t been as high as it was before he came to Philly. As of January 4 (the day before he challenged Brown in a film session about his role), such plays accounted for 24.1 percent of his possessions in a Sixers jersey, compared to 35.7 with Minnesota to start the season (and 31.2 last season). It was fair for him to question Brown and make his case to run more. He should. And we’ve seen more recently as well, especially against the LA Clippers on New Year’s day. But there’s only so effective it can be. The Sixers could use more shooting in general, whether that’s off the bench or at the four as an upgrade over Wilson Chandler. Primarily, though, Butler-Joel Embiid pick-and-rolls have limited breathing room with Simmons on the floor, often hanging in the dunker’s spot. It’s far easier for defenses to send extra help at Embiid rolling or Butler driving. Adjusting roles to use Simmons as the roll man a little more often is one way to help counteract this. Simmons has been recorded as the roll man in pick-and-rolls on a mere nine possessions this season. Part of this near nonexistent usage as a traditional roll man is down to the nuance of how his ability to dive to the basket is used. A crafty pick-and-roll ball handler isn’t always essential when dribble hand-offs can be used to great effect. If the screen connects or the shooter’s defender goes under the screen, they have a chance to pull up. If Simmons’ defender is forced to hedge, or rim protectors step too far up the lane to help (as Marcin Gortat wrongly does in the first play of the clip above), Simmons can take off before the defense has time to catch up. Dribble hand-offs have worked well with Butler already. Simmons can do more, though. 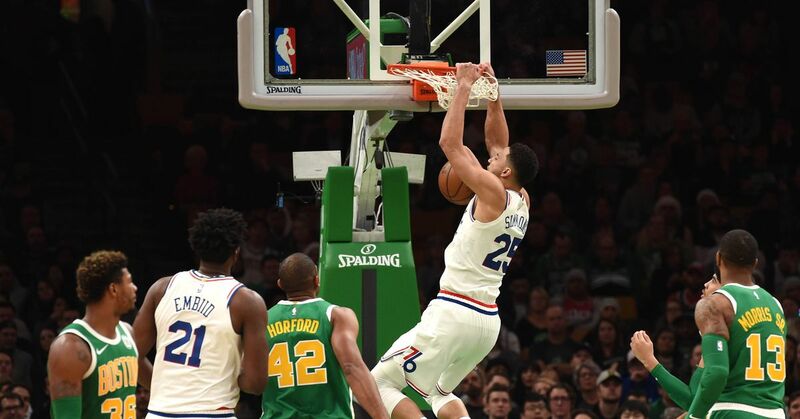 If Simmons’ screen doesn’t create room for Butler to attack, these are the kinds of positive outcomes the Sixers can hope for — an out-of-place rim protector, an open 3-point-attempt for Embiid, or a shifting defense that sends help to tag Simmons and opens up passing lanes for Butler to open shooters. At the very least, it’s removing the instances where Simmons is a negative spacer off the ball. This is where the Sixers’ unique personnel can give them some tantalizing options. Butler has the creative skill set to mess with teams through Spain pick-and-rolls (where a shooter sets a back screen for the roller, then pops to the arc), but rather than the center being a predictable roll man, Embiid can pop to the arc and Simmons can roll. It’s one way to utilize Butler more as an initiator, while easing the concern of Simmons’ absent shooting. And even though there’s a limit to how much space a center can provide as a 30.1 percent 3-point shooter, Embiid’s volume from deep (3.8 attempts per game) and overall scoring threat still commands attention. That said, these changes aren’t just for the starting five. Butler has the opportunity to run more pick-and-roll with Simmons when Embiid is on the bench. The two headband brothers are hardly apart on the court — Butler has spent 641 of his 729 minutes with Simmons. The priority when they’re without Embiid (and his two-man-game partner Redick) is surrounding them with as much shooting as possible. Three-man groups such as Landry Shamet, Wilson Chandler and Mike Muscala provide some space and a pick-and-pop five for Butler. Against smaller teams, Simmons could be deployed in short bursts at the five with four shooters. Despite Simmons not being the screener Embiid is, plays like this are also a good way to get him more chances to seal off his man under the basket for short post-ups — something he’s done extremely well this season — if he isn’t rolling through the paint. Plus, Butler having the ball to create if things break down, rather than T.J. McConnell, always helps. Simmons doesn’t need to be the freakish finisher that Giannis is to utilize these plays. He still has the size and speed to finish through defenses that are left a step behind. And if the defense recovers and help arrives in the paint, Simmons is still in position to go straight into a short post-up. Clearly, the Sixers’ offense can grow. It needs to at some point. When Redick, Butler, Simmons and Embiid are all together, they’re clicking with a 110.6 offensive rating. Take Redick out of the equation, and the Big 3 are left with a 84.8 offensive rating without him, hinting at the need for more shooting and tweaks for the trio of stars. However, we’re still dealing with small sample sizes. Plus, the new starting five has a 15.3 net rating together. They’re the third-best five-man lineup in the NBA (with a minimum of 150 minutes played), suggesting how imposing the Sixers can be when their stars are joined by positive shooting. Just think how helpful a better spacer than Wilson Chandler would be at the four. Furthermore, the successful staggering of the Butler-Simmons and Embiid-Redick duos is one way spacing concerns of the Big 3 can be alleviated somewhat. Butler-Simmons has an 8.7 net rating without Embiid, while Embiid-Redick is a +12.6 without Butler and Simmons. This team isn’t 18-9 since landing Butler by accident. With Philly’s weak perimeter defense and woeful depth, it’s easy to complain. But for the starters, the fit was never going to be perfect. It’s shortsighted to question this team’s upside after just 23 games to gel on the fly. There are ways to evolve, and Butler and Simmons in particular have been impressive together. To tackle some of these spacing concerns and add a new wrinkle to the offense, using Simmons more as a roll man is one change to make. All statistics courtesy of Basketball-Reference.com and NBA.com.